Few years ago, we conducted a survey if social signals influence Google rankings? We got almost 500 replies from the SEO community and I figured it would be a great day to share that reply. In a nutshell, only 12% said social signals have utterly no influence on Google ranking. 88% said there was some influence. Only 46% responders were saying that they were social influence on Google rankings. 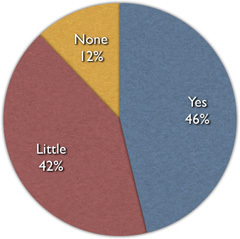 Only 42% responders were saying that they were little social influence on Google rankings. 12% said there was no social influence on Google rankings. Who is correct? Might be the 12%. But it based on how you consider the query. Main ranking? No personalization? Omitting the fact that social impacts backlinks? Anyway, there you have it.